Microsoft has made some changes to OneDrive storage quotas. Learn how this impacts existing Office 365 Home, Personal, and University subscribers. Microsoft previously announced that unlimited OneDrive storage would be rolled out to Office 365 Personal, Home, and University subscribers. On November 2, 2015, Microsoft announced that this plan had changed and those subscriptions would continue to include 1 TB of OneDrive storage. If you are one of the Office 365 consumer subscribers who received extra storage and have stored in excess of 1 TB, you will be notified of this change and will be able to keep your increased storage for at least 12 months from the date of that notification. See OneDrive storage changes - FAQ for details. What’s included with my Office 365 Home, Personal, and University subscription? Office 365 includes the new Office 2016 apps for your PC or Mac, an optimized experience on your mobile devices, 1 TB of OneDrive storage, and 60 monthly Skype minutes to call landlines and mobile phones around the world*. Plus, you get ongoing upgrades and Microsoft Answer Desk technical support. *Skype minutes are not available in all countries. See Office 365 FAQ for details. I bought an Office 365 Home, Personal, or University subscription to get OneDrive unlimited storage. Can I get a refund? Yes, you can cancel your Office 365 subscription and receive a full refund. You have an active Office 365 Personal, Home, or University subscription as of November 2, 2015. 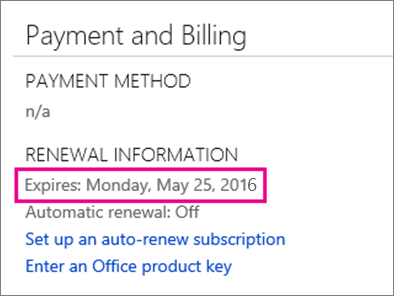 You cancel your Office 365 subscription and request your refund by June 30, 2016. In order to cancel your subscription and request a refund, contact a Microsoft Accounts and Billing agent. It may take six to eight weeks for you to receive your refund. If you have more than one Office 365 subscription, you must make one refund request for all your subscriptions at the same time. You may be asked to provide proof-of-purchase documentation. Trials and free subscriptions are not eligible for a refund. Microsoft reserves the right to deny any refund request that it deems to be fraudulent. How can I find when my Office 365 subscription ends? Sign in to your Office 365 account. Navigate to Payment and Billing to see your renewal details.